The L'Amour flutes by Stole brings a touch of flair and romance to that special day. 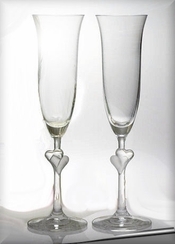 The pair of German crystal flutes features double hearts intertwined into its stems to offer that touch of amour with every sip. Personalize them with 2 lines of text; up to 20 characters per line including spaces. 6.25 oz. capacity, stands 9.5" high.